On 2 April 2017 Lenin Moreno, the candidate endorsed by outgoing president Rafael Correa, was announced to be the winner of the Ecuadorean Presidential election by a narrow majority of some 200,000 votes – 51.1% to 48.9%, a narrow victory to be sure, but a victory nonetheless – all the sweeter for the fact that all the candidates eliminated in the first round of the election in February gave their support to Moreno’s opponent, the billionaire banker Guillermo Lasso. Although the defeated candidate predictably screeched that the election had been rigged, no fewer than 280 foreign observers were present to confirm that simply would not have been possible. 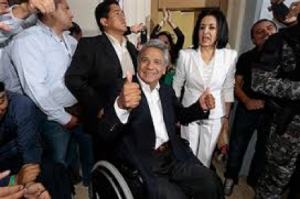 Lenin Moreno’s victory is a victory of the Ecuadorean masses who were able to resist the propaganda of the bourgeois media to bring back a government that would do its best to work in the interests of the people rather than in the interests of foreign multinationals. They have not forgotten that Correa’s 10 years in government lifted over a million people out of poverty and made free education and healthcare available to all. Nevertheless, it is common at election time for the incumbent individual or party, as the case may be, to become the fall guy for economic woes that result from clinging to the capitalist system. Correa, and therefore by extension Moreno, had problems in meeting the Ecuadorean people’s hopes and expectations because of the plunge in the price of oil, the country’s principal export that supplies over 45% of the government’s income, and last year the Ecuadorean economy went into recession. Previous governments, whether of the left or the right, civilian or military, had turned to borrowing from the IMF, either so as to avoid introducing an abrupt drop in living standards, and consequent civil unrest, that would arise if government spending decreased in line with oil revenue, or so as to invest in increasing oil production in order to sell much more to secure the same return. IMF loans were given at high rates of interest, which seemed all right at the time when oil prices were high – in fact the high price of oil was a factor in causing dollar inflation, which resulted, so long as it lasted, in interest payments being worth less in terms of purchasing power. Lower oil prices, on the other hand, were not accompanied by any reduction in the interest rates of debts that had already been incurred, which were soon soaring over commercial rates but still had to be paid. It was only a matter of time before Ecuadorean governments were borrowing to repay loans. Moreover, the IMF loans were generally conditional on lowering tariff barriers and cancelling other measures designed to foster diversification of industries within Ecuador as well as to reduce the public spending that provided employment for hundreds of thousands of people besides providing such services as education and health. For 40 years or more Ecuador has been caught in this trap, which even the most progressive of bourgeois governments is unable to escape. The difference of approach between Moreno and Lasso, then, amounts to this: Lasso wanted to encourage more foreign investment, which meant more super-exploitation, and to tempt investors by lowering taxes (and therefore cutting government income), with the inevitable consequence of lowering public spending, squeezing services, passing control of Ecuadorean assets to imperialists, and loss of jobs. This policy could not but make the Ecuadorean poor both poorer and more numerous. Moreno, on the other hand, seeks to borrow more to make ends meet, to maintain public spending and subsidies to help the poor, and to support local businesses, but there has to be a question mark over his ability to do so. If he does, it can only be at astronomic rates of interest since the only security he can offer is Ecuador’s future oil production which has already for the foreseeable future been sold off to China. His predecessor in just the last half of 2016 borrowed $2.75bn on world money markets at an interest rate of 9.65% on 10-year bonds. It is thought that at least $8.6bn of Ecuador’s debt is owed to China, to whom the Correa government was able to turn for some relief and which does not impose harsh conditions or charge outrageous rates of interest, but China cannot provide all the finance the Ecuadorean government needs. In their efforts to avoid a Moreno victory, the corporate media are making huge efforts to implicate his Party, the Alianza País, in corruption scandals, in parallel with the Petrobras scandal with which the imperialists succeeded in bringing down the progressive government of Dilma Rousseff in Brazil. They have been unable to associate Moreno himself with any kind of improper dealing but have focused instead on his running mate, Jorge Glas who was for a time in charge of Petroecuador. On hearing allegations of corruption in that organisation, Correa’s government immediately initiated investigations, and the result, according to the Miami Herald, was that “last year … eight former and current officials were investigated for money laundering and bribery for their roles in manipulating contracts with the state-run Petroecuador oil company. “At the time, the company was under Glas’ purview. Last week, former Petroleum Minister Carlos Pareja appeared on social media videos hooked up voluntarily to a polygraph machine and accusing Glas of knowing about Petroecuador corruption” (Jim Wyss, ‘Will a “Miami scandal” turn the tide of Ecuador’s presidential race?’, 9 February 2017). At the same time, the Miami Herald had to admit that Pareja “never provided any hard proof about his allegations”. In any event, Pareja was hardly a disinterested party, since he had fled the country on September 28 in anticipation of the outing of his own corruption, and that of members of his close family, in connection with contracts to set up the 2014-15 refurbishment of the Esmeraldas refinery, impropriety that he admitted in private emails to President Rafael Correa in which he begged for forgiveness, claiming he had only made a mistake but had not been dishonest or treacherous. Correa invited him to return to Ecuador to stand trial, but this Pareja was not prepared to do. Correa told him that as a result of his actions, the whole government would be regarded as being tainted with corruption, which is why what he had done could not be considered anything other than treachery. “His formal entry into politics began in 1998 — just one year after charges were dropped against him in a case related to loan irregularities connected to Ecuador’s central bank — when he was appointed as the governor of Guayas province by President Jamil Mahuad. During that year’s election campaign Lasso had been one of Mahuad’s biggest donors. “Despite, or perhaps because of, Lasso’s controversial short reign as governor — where he attacked civil servants and used state police to violently repress union demonstrations — Mahuad appointed Lasso as Ecuador’s minister of finance and energy in 1999. “In that role, Lasso — in a departure from his current promises to eliminate corporate and inheritance taxes — oversaw a significant increase in the sales tax on basic goods which primarily affected poor and middle-class Ecuadoreans. “He resigned as finance minister just months before Mahuad fled the country after being ousted by an Indigenous-led uprising in the wake of a massive banking and dollarization scandal. “Despite overseeing Ecuador’s economy in the lead-up to the country’s worst ever economic crisis, Lasso himself was never charged in connection to the banking scandal which crippled the country’s economy and led to the forced migration of almost three million Ecuadoreans. “In fact, President Mahuad’s decision to freeze all bank accounts in the country for a year eventually meant millions of dollars in profits for Lasso and his bank, as people were forced to withdraw their savings at half their value. Be that as it may, it would have done Ecuador and Latin America no good at all to fall back into the backyard of the US of A, to be subjected to intensified super-exploitation as the US tries to overcome its own economic problems at the expense of all the oppressed countries which it is able to influence.